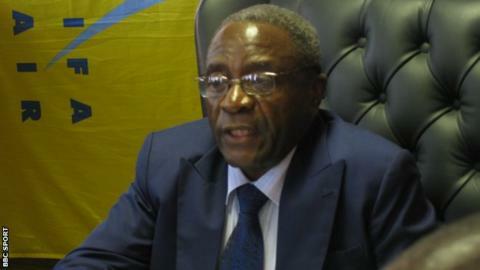 Zimbabwe FA (Zifa) president Cuthbert Dube resigned before a meeting that passed a vote of no confidence. He had been set to continue in the role until elections are held on 5 December but has now been replaced by CEO Jonathan Mashingaidze until then. Football's world governing body Fifa says they will not be sending any more development money to Zifa until fully audited accounts have been produced. Dube had been in charge for five years, when Zifa's debt rose to around US$ 6m. The financial crisis lead to national teams repeatedly struggling to fulfil away assignments due to a lack of funds. He quit late on Friday, ahead of a Zifa extraordinary general meeting set for Saturday, with four representatives from Fifa and Caf in the country to oversee the vote. The no-confidence vote went ahead with 51 of the 54 members voting to remove Dube immediately. Dube has used his personal funds to assist national teams on many occasions, but his detractors say that this is a sign that Zifa lacks sound financial structures. Zimbabwe was excluded from the upcoming 2018 World Cup qualifiers because of a failure to settle a $67,000 debt with former coach Valinhos, and there is a threat of a ban from the 2022 qualifiers as another former coach, Tom Saintfiet, has approached Fifa after taking legal action over money owed by Zifa. "While I have been a subject of humiliation over the past few years, I will leave office with my head high in view of the Goal Project legacy I have left," said Dube. "It is common cause that I am the only Zifa president that presided over a Goal Project and saw it to its completion. "A good number of national team assignments would not have been fulfilled without commitment of my personal resources and assets." The Zifa Assembly passed a no-confidence vote on Dube earlier this year, but he successfully argued that the process was unconstitutional. This time he decided that his position was untenable.